With 16 years history in developing hifi speakers, CNSZNAT has rich technical force and abundant experience. For the last 700 days and nights, we have been engaging in designing, testing, contrasting and debugging the sample speaker again and again and each product saturates with our engineers' passion and dedication since it is all manual work. Each component are rigorously selected and materials are specially developed for the best sound effect. It is really a veritable feast for the mind. Unlike the electronics, the 4-inch full range hifi enter channel speaker will never go out of date. Featuring hifi full-range speakers, sophisticated crossover network and well designed dual phase reversal tube, you get high quality, accurate and balanced sound reproduction with more precise frequency division. The dual phase reversal tube design is one of the appeal. Thanks to our workers' the meticulous engineering and exquisite craftsmanship, we have made this special tube that can deliver punchy sound with excellent vocal clarity. Our speakers can produce crystal clear and detailed treble, transient and impactful bass and full mid- range. They really shine in mid-range since the sound is more full. And it is compatible with most digital amplifier and perfectly match with tube amplifier. It fills small to midsize rooms, such as home theatre, office or garage. And it fits any indoor sound application, including stereo music, games, movies or video editing. DESIGN - Wood Cabinets are finished in matte black with baking varnish, which has elegant,stylish and classic look, while small and compact cabinets save more space and easily blend into your listening environment. 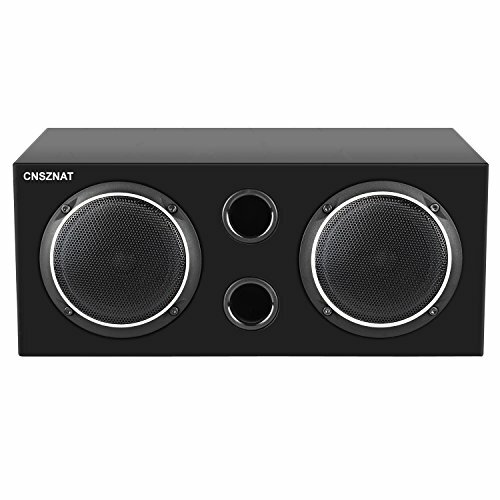 THE TIMBRE IS OUTSTANDING- Perfect the vocals and dialogue of your favorite music and movies with the CNSZNAT Hifi speaker. Mid-frequency sound full and comfortable, high-frequency clarity and detail rich, sound authentic, voice sweet and clean. Low-frequency is more punchy compared with other hifi bookshelf speakers in same size. PERFECT TECHNOLOGY DETAILS PROCESS- Dual Phase Reversal Tube Design makes sound more mellow; built-in acoustic foam yielding clear sound. Built-in the divider by sophisticated design, so that the sound is more resistant to listening, more balanced, never bored. It is widely compatible with all kinds of amplifiers and perfectly match with tube amplifier. GOOD COMPATIBILITY-It fits any indoor sound resource application, including TV, computer, tablet PC, smartphone or other devices. And it fits small to midsize rooms, such as home theatre, office, art gallery or living room. If you have any questions about this product by CNSZNAT, contact us by completing and submitting the form below. If you are looking for a specif part number, please include it with your message.